One of our favorite color combinations is TURQUOISE with BROWN! In our La Jolla shop, we always seem to sell that combination first of any offered. 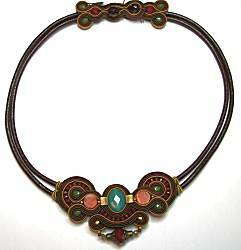 Maybe it is the sky and earth influence, the southwest design appeal, or the fact that these two colors have warmth and look nice on so many gals. So here we show you how good it looks in handbags, belts and jewelry! 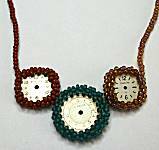 Small watchfaces, in silver and offwhite colors (no moving parts) are captured with peyote woven beaded frames and backs, the tiny glass beads in brown, teal and champagne gold colors. 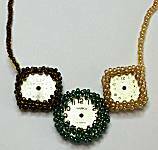 The trio span 2 inches of necklace front, tiny glass beads extend to the back where a self-loop of beads can be hooked over either of 2 beads for length of 16 or 17 inches. Joanie M earrings, 2 inches long on silverplated earwires, 1 inch across. The diamond square of fused glass has raised dot at the center for dimensional interest, the colors work upward from black to golden brown to green to peacock teal blue. 7-3/8 inches long, about 1-1/4 inch wide with all the beads jutting forth from the peyote woven seed bead band underneath. Flexible and as comfortable as a ribbon draping around the wrist, the magnetic clasp is completely hidden by beads, easy on and off. Light periwinkle blue, seafoam green, bronze, chunks of tigers-eye. 8 x 6 x 1-3/8 inches, this yummy soft all-leather bag features long leather wrapped cord to wear cross-body for walking, and you could easily tie shorter for shoulder-wearing if preferred. Zip top in coordinating color, chrome hardware at a minimum for securing cord holes and zipper pulls. Body is turquoise color leather. On the front is open pocket trimmed in whipped-stitch of saddle tan leather strip. On the back is coordinating saddle tan color zipper on lined pocket. Saddle tan zip top has tassel on the pull. Interior lined in brown fabric, with small zip pocket trimmed in turquoise leather. 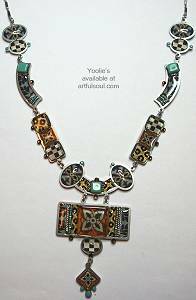 Rich turquoise color leather on top with tooled patterns, has cutouts to reveal the smooth metallic cognac reddish copper underneath. Golden topstitch details emphasize the scrolls. Bag measures 9-1/2 x 6 x 2 inches, has a full zip top. Interior lined in signature black/gold scroll fabric with a small zip pocket. 24 inch shoulder strap for high shoulder wearing has double folded cords, captured to bag with chrome hardware and wrapped whipstitch detail. This has more features than immediately meet the eye! Measures 14 x 7 x 4 inches. 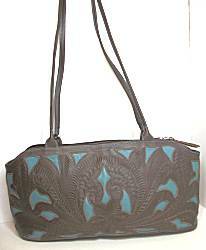 The dark chocolate brown leather on top has tooled patterns, cutout to reveal the dark turquoise leather underneath. Topstitch detailing. Both front and back have a large open compartment that is closed simply with a snap, each lined in black/gold scrolling fabric. Full zip top over the larger center compartment, that has the same lining. Interior has 2 zipper pockets, a cell phone pocket, and 3 slots for credit card/ID items. Dual 28 inch shoulder straps are leather-wrapped cord, very soft and flexible. This small bag can be your go-to bag when you don't need to carry the entire household with you! Measures 8-1/2 x 5-1/2 x 2-1/2 inches. 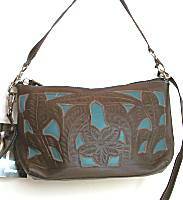 The soft chocolate brown leather has tooled designs, then cutout areas to reveal smooth turquoise leather underneath. Topstitch detailing. Full zip top opens to black/gold scrolling pattern fabric lining. There is a cell phone pocket and zip pocket. Two strap options are thin folded leather, detachable, a choice of 16 inches or 46 inches. You could even join together if you need it even longer, or attach the smaller one in a loop to carry as a wristlet clutch! 3 inches long including copper finish earwire, 2-1/4 inch long pendant is shaped like petal of an orchid with ridged edges, made with fine metal mesh and colored in black, dark copper brown and dark teal toward the tip. 1 inch across, lightweight! Soft and thin cow leather tapers from 2-1/4 to 1 inch wide, about 11 inches long. Designed to wrap and overlap the narrow end over the wide, closing first with velcro (easy), then securing further with snap. Choice of sizes for snug wearing, you do not wear this like a bangle! 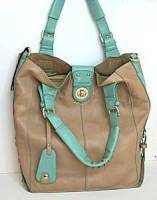 The leather is embossed with floral motif, then colored in metallic bronze, aqua and apple green. Dozens of Swarovski crystals in AB color line the outer edges and over the snap. Lasercut stainless steel elements are joined in simple line, but with curving shapes this will lay nicely around the neck. Defined color pattern areas are covered by domes of clear resin for depth, tiny crystal and stone accents offer additional interest. Colors featured include turquoise aqua, copper, navy, black, gold, white. Length on stainless chain adjusts 19-22"